On Thursday evening, folks on Twitter noticed something different with Toronto Raptors point guard Delon Wright’s suit when the team posted pregame pictures before the club’s matchup against the Milwaukee Bucks. Wright’s entire outfit was comically oversized. 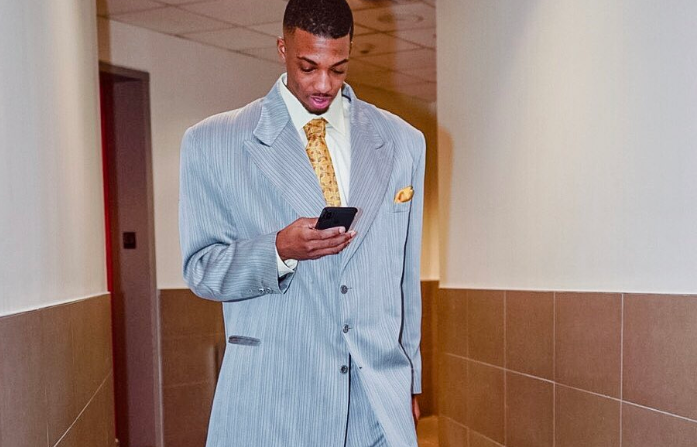 Wright’s suit was straight out of the 2003 NBA Draft, as one Twitter user hilariously Photoshopped him into the iconic photo. On first glance, it appeared Wright must have lost a bet or was feeling a throwback Thursday outfit. It turns out, the suit was all part of a marketing campaign for Snickers. I don’t really understand how being so hungry made him wear the suit, but sure, why not? Deep down, I hoped the fashion decision was legit and not some marketing ploy, but we can’t always get what we want. I respect Wright for at least giving us almost 24 hours of questioning why he was wearing it – even if the true reveal is a bummer.